Base oils are a core component for producing lubricants that are used in several ways throughout the petroleum industry. When crude mineral oil is refined, a large part of the high boiling fractions are included. Even though most of these fractions are transformed into volatile compounds via crack process, a smaller amount is used for lubricating oils. PhosLube specializes in lubricating base oil analysis, focusing primarily on clients within the refining, re-refining, blending, raw material production, and raw material evaluation industries. PhosLube also specializes in quality control/quality assurance for finished products. 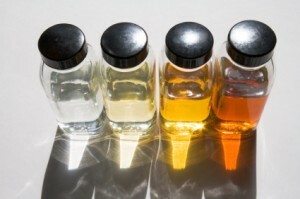 Certain tests like pour point and viscosity all depend on the ratio of aromatic and saturated products. Therefore all lubricating base oils are classified into five groups. The group with the smallest fraction of aromatics typically has the highest quality. Group 1 may contain more than 10 % aromatics and less than 90 % saturated compounds. Group 2 must contain less than 10 % aromatics and more than 90 % saturated compounds. Group 3 contains less than 1 % aromatics and more than 90 % saturated compounds. The 4th and 5th groups include fully synthesized products without aromatics. Therefore, the importance of determining hydrocarbon types through base oil analysis is critical.